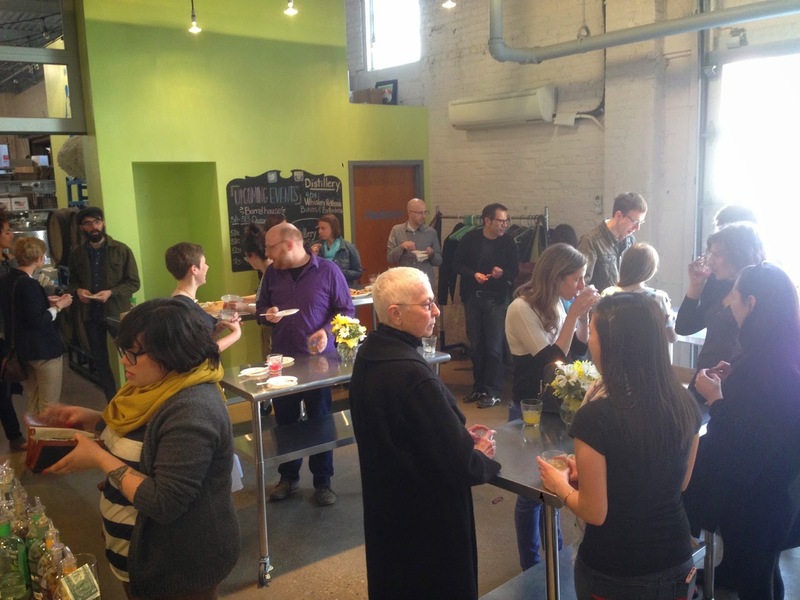 We hosted an MF Volunteer Appreciation Event last night at Wigle Whiskey in the Strip District! Volunteers and staff enjoyed custom cocktails before a guided tour of the distillery's facilities. After a whiskey tasting and sushi, awards were given to just a few of our many dedicated volunteers. The museum couldn't run without these dedicated individuals and we thank each and every one of them for their support! We’d also like to thank these organizations for donating gift cards/passes for our outstanding volunteers: The Warhol Museum, Monterey Pub, Big Burrito Group, Max’s Allegheny Tavern, James Street Gastropub, Cleveland Cinemas, Carnegie Museum of Art, Primanti Brothers and Nine on Nine. Interested in volunteering at the MF? We'd love to have you! Attend the next Volunteer Orientation or contact volunteer@mattressfactory.org for more information. Have you ever been exploring the museum and found yourself saying: I wonder how they made that, or I wonder what the inspiration behind that work was? 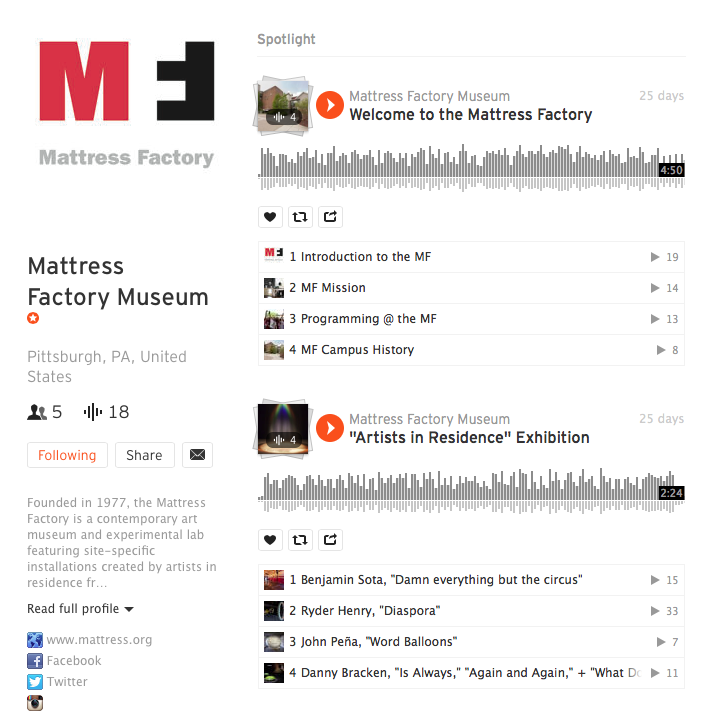 Some of these answers may surprise you, and with our brand new audio guides, the Mattress Factory is offering you the chance to dig deeper into your favorite installations, and even into some behind-the-scenes commentary on the museum itself. Simply go to mattress.org and click this image at the top of the page when it scrolls by, or click the Audio Guides icon on the bottom right corner of the home page. This will send you to the Mattress Factory's Soundcloud page, where you can listen to one of our museum educators walk you through the artist, materials, and vision behind the making of any installation of your choice currently on display. You can also listen to MF Co-Director Michael Olyjnik talk about everything from how Sarah Oppenheimer managed to build her hole in the floor, to the history of each of the buildings that now belong to the Mattress Factory, to the Mattress Factory's artist-centric mission and the seemingly endless variety of materials used to facilitate the vision and work of artists throughout the years. Audio Guides can be listened to while exploring the museum, with complementary headphones at the door or with headphones of your own, or after you've visited and had the chance to experience the works for yourself. We hope you enjoy this round of guides, and there will be more to come with future exhibitions! 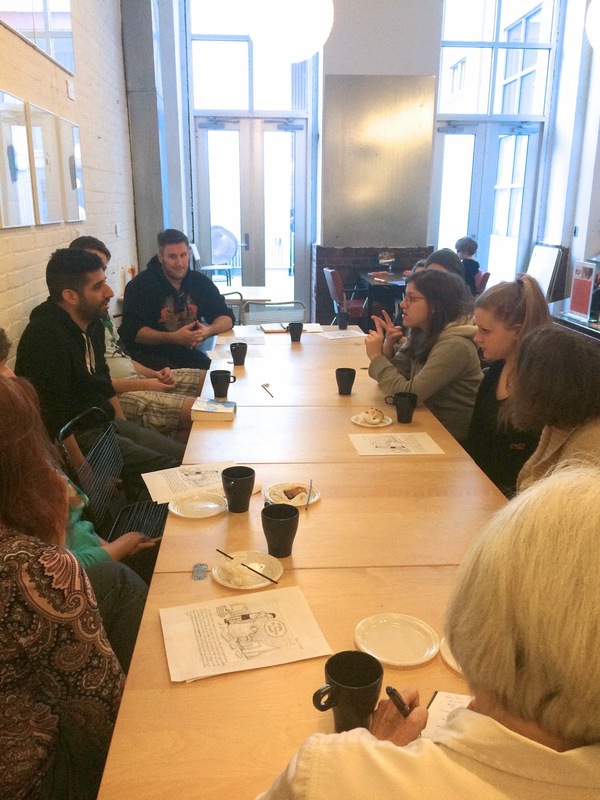 MF Members gathered around the tables in the MF Café this past Saturday to have a conversation with artist John Peña! The chat naturally revolved around the making of John's "Word Balloons," on view through May 31 at the museum. 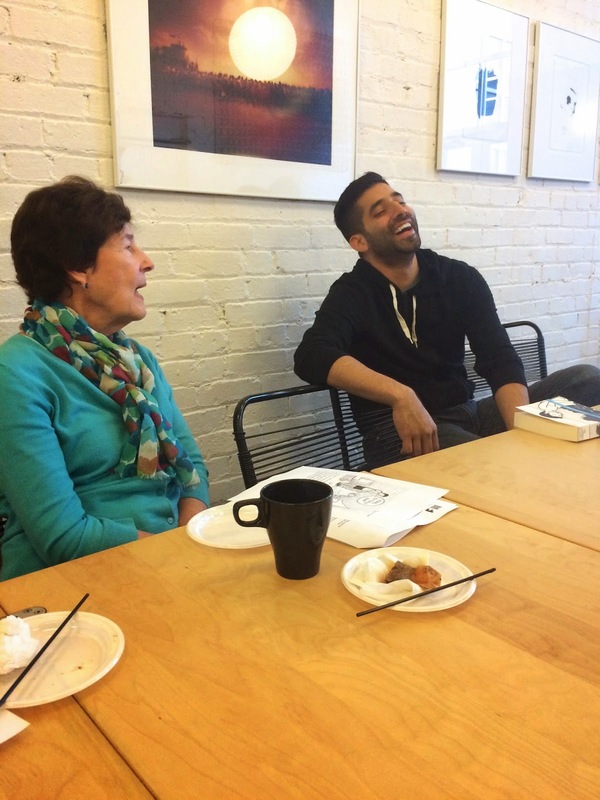 Over the duration of a cup or two of coffee, John explained how the word balloons evolved from a project he began over a decade ago called "Letters to the Ocean." Since 2003, John has written over 3,000 letters to the Pacific Ocean about his daily happenings. John sometimes included private drawings to accompany these letters. Hiding these drawings in a letter addressed to the Pacific Ocean, John explained, was a way to express himself without exposing himself. "Eventually I realized I was censoring myself," John explained. So he decided to stop hiding his drawings in letters that would never be opened. "Daily Geology" is a compilation of all his drawings from 2014. 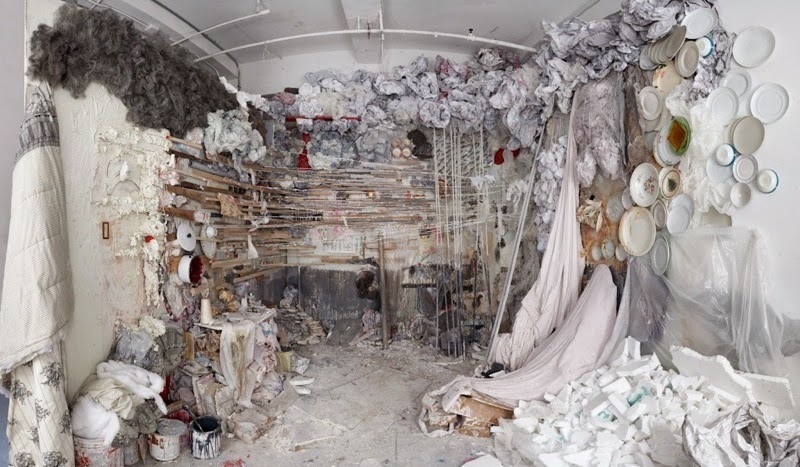 The phrase "Sometimes I just don't know how to be in the world," written on one of the two word balloons John created for the Mattress Factory, was taken directly from one of John's daily drawings. The next Coffee Date will be Saturday, May 2, 2015 with upcoming artist in residence, Julie Schenkelberg. This Coffee Date will take place in our 1414 Monterey Street gallery. Please RSVP to Caitlin Harpster, Development & Membership Coordinator. A previous work by artist Julie Schenkelberg. 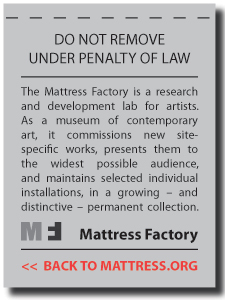 We have a unique opportunity that would allow your own items to become part of a new work at the Mattress Factory! Julie Schenkelberg, an artist who has been chosen to present work in our upcoming Factory Installed exhibition in the museum's 1414 Monterey Street gallery, is in the process of collecting materials for her installation. Though our exhibitions team has been searching high and low for the materials she has requested, we need a lot more. If you have any of the items below that you've been meaning to discard, please consider donating them to this project. Items cannot be returned and might be altered or damaged in the making of the artwork. -Blue or green porcelain items, plain or decorated. Light blues and mint greens are especially in demand! -Old wooden chairs, tables etc. Broken is okay! This list may grow! Check back for additional requests. Donations can be dropped off at the Mattress Factory Admissions Desk during regular museum hours. If you have a large collection of items that need picked up, please contact Exhibitions Manager Owen Smith directly. Thank you. and we hope to see you (and your things) for the opening May 15! Join us for April's "MF After 5" event! Museum doors will be open until 8pm on Thursday, April 16 and Kevin Clancy's silent video installation your heart is a prism will be on view in the MF Lobby as part of our ongoing SCREENINGS series. Live sound performances will accompany Clancy's work throughout the evening. Can't make it April 16? Swing by on Sunday, April 19 between 1-5pm to see additional live sound performances created in response to Clancy's work. From the artist // A new prismatic video installation for Mattress Factory's SCREENINGS series. 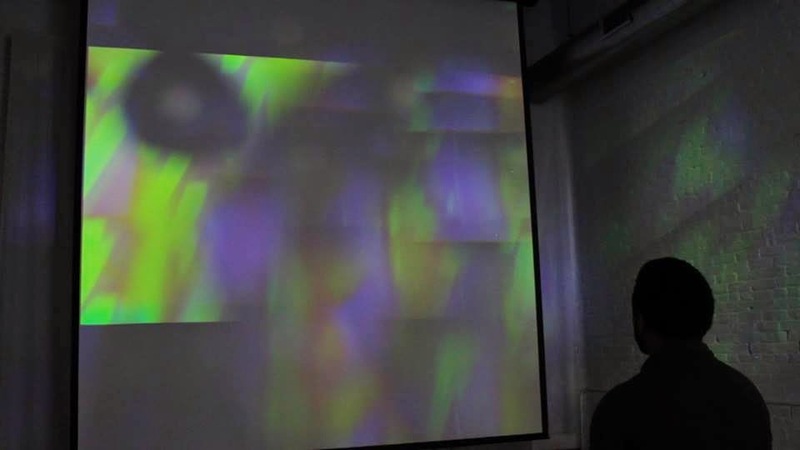 All visuals are produced through analog and physical processes, bending light through a series of crystals, prisms, colored plexiglas, rainbow diffraction grating films, emergency blankets, and lenses during a week at Cat Mansion Residency in Ann Arbor, MI and Sleeping Bear Dunes in Empire, MI. The title and mantra of this piece was inspired by the “Your Heart Is A Prism!” poster by Peter Glantz, Becky Stark, and Jacob Ciocci. Check out their respective mountains of awesome work. The MF's Factory 500 membership group got a special look at the historic Federal Courthouse located downtown on Grant Street. Courtroom deputy clerk Michael Palus lead the group on a detailed tour throughout the building. Factory 500 members got to experience the beautifully restored historic courtrooms with their plush carpets, high ceilings and beautiful murals dating back to 1936. Unfortunately, no photographs [or cell phones] were permitted in the building for security reasons. Following the courthouse tour, members made their way down the street to Jones Day, an international law firm, for an artist talk and reception. Upon arrival, Jones Day Partner-in-Charge Laura Ellsworth gave a brief introduction to their corporate collection highlighting some of her favorite pieces. Pittsburgh artist Ron Donoughe was present to give an overview of his work in the collection, and to discuss a new project he's been working on for the last year. Thank you to everyone who came to the Federal Courthouse and Jones Day. To check out more photos from this Factory 500 event, and past events, please visit our Flickr page. Stay tuned for information about our next Factory 500 event this spring!